Performed at Circle Players in Piscataway, NJ. July 11-19, 2008. Our second stint with Circle was yet another groundbreaking collection of recognized and award-winning one-act plays written, directed and performed by the Porch Room. Accidents Happen was named Outstanding Production of an Original Play at the 2009 NJACT PERRY AWARDS, along with two other wins and two other nominations! 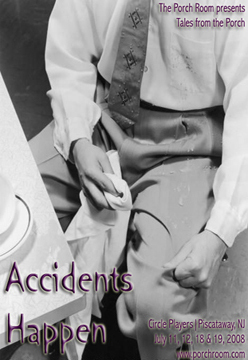 Accidents Happen is available for performance by arrangement with Samuel French. View photos from the original production.